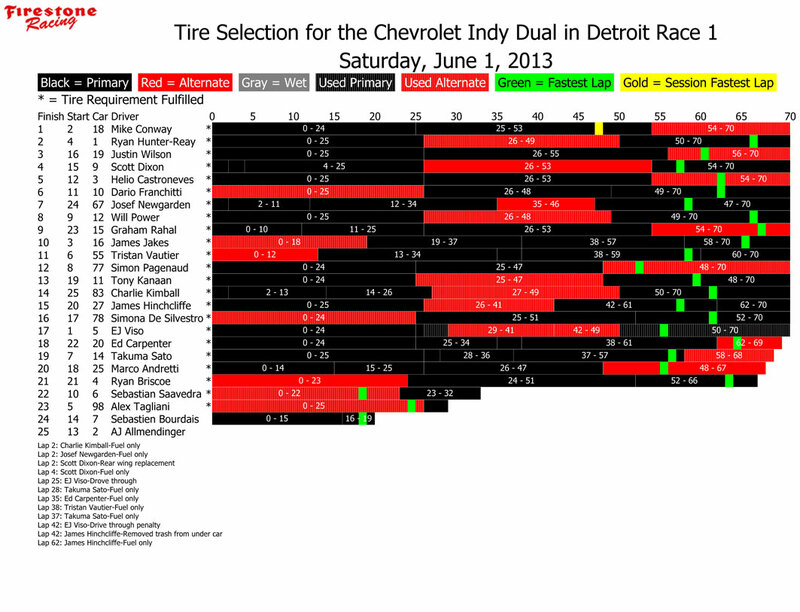 Wets: 436, each entry has six sets (24 total tires) of the rain tire that debuted last year in Detroit available this weekend.The Firestone primary and alternate tire specifications for Belle Isle are the same street-course specs that were used earlier this season at St. Petersburg and Long Beach.Per series regulations for doubleheader race weekends, all cars must use at least one set of primary tires and one alternate set during each race, each for a minimum of two green-flag laps. Otherwise, teams are free to use their tire allotment at their discretion. 17:00 left: Red flag for 11-Kanaan making contact with the tires in turn 6; minor damage. Group 1, 3:30 left: red flag for 98-Tagliani spin coming out of turn four; no contact. Tagliani loses two fastest laps. Round 2, 2:30 left: red flag for 3-Castroneves spin and stall in turn 3. Session ends under red. Castroneves loses two fastest laps. 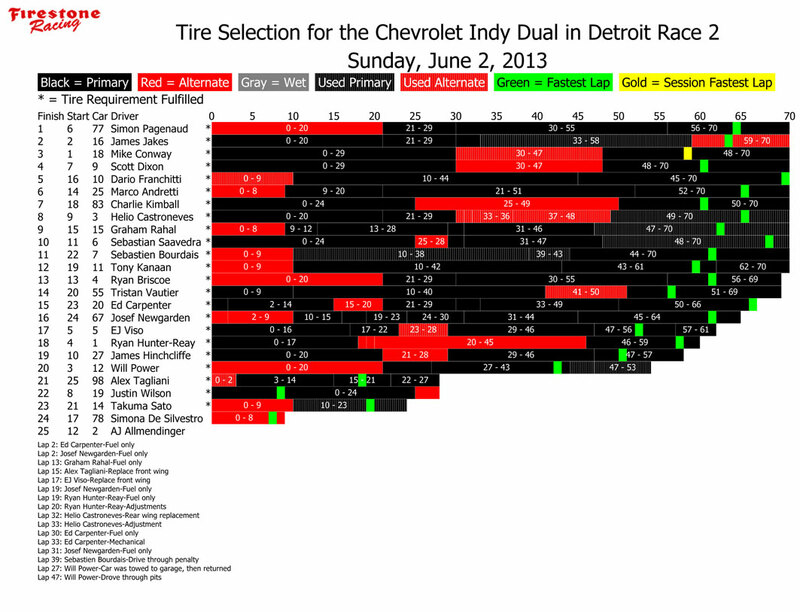 Serving grid penalties for race 1: 10-Franchitti, 15-Rahal, 67-Newgarden, 83-Kimball. 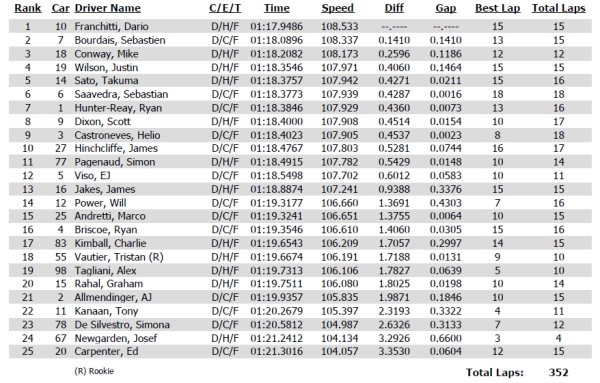 Group 1: 1-Hunter-Reay, 2-Allmendinger, 7-Bourdais, 10-Franchitti, 16-Jakes, 19-Wilson, 25-Andretti, 27-Hinchcliffe, 55-Vautier, 67-Newgarden, 77-Pagenaud, 83-Kimball,98-Tagliani. Group 2: 3-Castroneves, 4-Briscoe, 5-Viso, 6-Saavedra, 9-Dixon, 11-Kanaan, 12-Power, 14-Sato, 15-Rahal, 18-Conway, 20-Carpenter, 78-de Silvestro. 1:10:00 left: Red flag for 67-Newgarden stopped at turn 3. 55:00 left: Red flag for 4-Briscoe spin in turn 11, no contact. 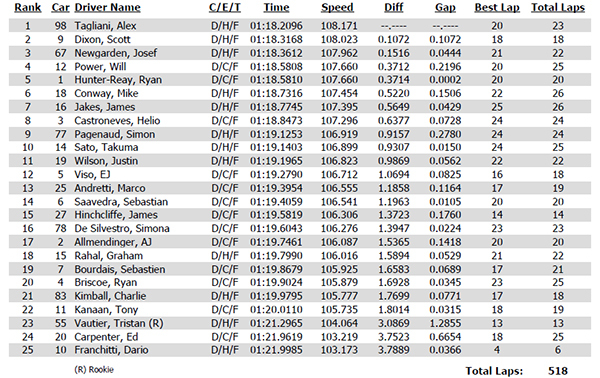 42:00 left: Red flag for 9-Dixon stopped at turn 9, no contact; and 10-Franchitti makes light contact with wall. 35:00 left: Red flag for 27-Hinchcliffe, contact with tires at exit of turn 1. 17:00 left: Red flag for 16-Jakes stopped at turn 11, no contact. 5:00 left: Local yellow for 2-Allmendinger, pulled off track at turn 7 with flat right rear tire. Are you sure about only 3 sets of alternate tires for the whole weekend? You must use a sticker set in each race therefore there is only 1 set to use in (up to) 4 qualifying sessions (3 rounds of knockout plus one split session on Saturday) this set could also be used as a scuff set in one of the races!